The healing crusade train of the Omega Fire Ministries worldwide (OFM) that had been to almost all the states of Nigeria and major countries of the world, on Monday 5th of February, 2018, berthed in Ughelli, Delta State, for another soul-winning encounter. The two days, quoting those lucky to have witnessed the encounter, saw outstanding testimonies of miraculous events in the lives of many. The Ughelli crusade led by the servant of God and president of the OFM, Apostle (Prof.) Johnson Suleman, like every other Apostolic visitation, was intended to usher in a new vista of spiritual, moral, physical, material, political and economic transformation for Delta State and by implication, the country at large. 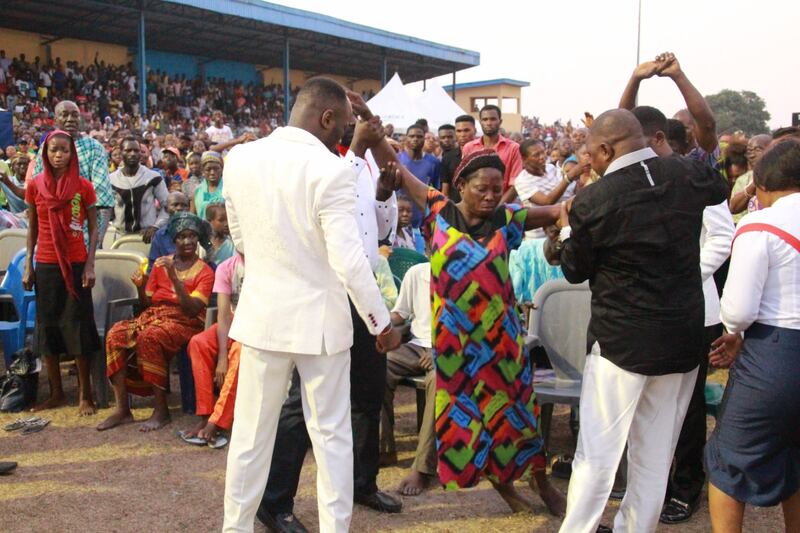 Tagged ‘The Supernatural 2018’, the crusade which held at the Ughelli Township Stadium was attended by thousands of people from across the world, including USA, France, the UK, Spain, Cameroon, Ghana, Benin Republic, among other countries. “What God has determined shall be done. The same spirit of favour, acceptance and testimonies that I carry, I transfer to your life,” professed the ‘Restoration Apostle’ as Suleman is fondly addressed, as he delivered by His divine power, hundreds of participants from diverse afflictions, both spiritual and physical. Two striking features of the crusade, however, had been about the miraculous encounter with an aged man and a couple. The old man who had been deaf and dumb from birth began to hear and talk the moment Apostle Suleman prayed for him and spoke power into his ears. The husband and wife came to the crusade ground to give their testimony from a past revelation given by Apostle Suleman. The couple had been through medical tests and was told they couldn’t have a baby. At the Ughelli crusade, the once fruitless couple shared testimonies of children, indicating their encounter with God through the ‘Oracle of God’. As he rounded up the crusade on Tuesday, 6th of February, 2018, Apostle Suleman assured that God shall make every participant’s deliverance and healing permanent.